The Mousetrap is the World's longest running play and audiences flock to the lovely St Martin's Theatre, situated on the quiet backwater of West Street - just a stone's throw from the bustling Cambridge Circus - to ponder the twists, turns and red herrings of this classic whodunit? As the audiences mill around in the theatre's foyer, they might notice a simple plaque on the wall. 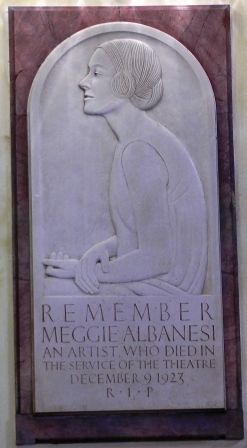 Some might even read its inscription, which urges them to "REMEMBER MEGGIE ALBANESI". It goes on to inform them that she was "an artist who died in the service of the theatre. December 9th 1923. R.I.P." They might make a mental note to find out more about her when they get home, or they might just give the plaque a cursory glance and then continue with their evening. Few, if any, of them will realise that they are looking at a memorial to a young woman who was, not only a contemporary of the likes of Sibyl Thorndike, Noel Coward and John Gielgud, but who was also, when it came to acting talent and charisma, very much their equal and who, but for her tragic death, at the age of just 24, had the potential to possibly outshine them all. Meggie Albanesi was born in 1899. Her father, Chevalier Carlo Albanesi, was an Italian violinist, whilst her mother, Effie Adelaide Rowlands, was the author of over 250 romantic novels. It was expected that Meggie would follow her father into music, but, at the age of sixteen, she enrolled at the Royal Academy of Dramatic Art (RADA) and her talent as an actress was quickly noticed and she was soon rewarded with major roles on the West End stage. Soon, critics were hailing her as the one of the brightest prospects of the English stage. Her success meant that, by her early 20's, she was able to afford her own flat, and, having established her independence, she threw herself enthusiastically into the whirl of the social scene of the day. In the early 1920's she enjoyed a major hit appearing opposite Owen Nares in the John Galsworthy play The First and the Last, directed by Basil Dean. There was most certainly a chemistry between the two stars of the play and they were soon romantically involved. The only problem was that Nares was married to the actress Marie Pollini, and when she found out about the affair she gave her husband an ultimatum, give up Meggie, or face a divorce. Nares chose to end their relationship, and Meggie was devastated. From that point on, despite her continuing success professionally, both on stage and in films, her personal life descended into promiscuous chaos. After her shows she would to hang out in local restaurants until she met a man to go home with for the night. Explaining herself to her good friend Fabia Drake she commented sadly, "you don't understand, the postman will do." She remained close to Basil Dean, and even enjoyed a relationship with him. He, in turn, was truly smitten by her. But her promiscuity took its toll. She underwent several abortions and, in December 1923, aged just 24 years old, she died from an intestinal perforation, said to have been caused by a pregnancy termination. Basil Dean remained besotted with her, even to the point of obsession. He is said to have taken his initial interest in his wife, the actress Victoria Hopper, purely because of her resemblance to Meggie. His lasting tribute to Meggie though is the plaque in the foyer of the St Martin's Theatre, which he commissioned the sculptor Eric Gill to create, and which captures perfectly the wistful elegance and nonchalance of a girl who, but for her premature and untimely death at such a tragically young age, may well have risen to become one of the titans of 20th century stage and screen. You can explore London in the company of Richard Jones, the author of the Secret London resource, and his fellow guides. Richard offers a daily programme of scheduled walking tours. The Secret London resource is broken down by district. By clicking on a section below you will be taken to the list of locations for that particular district.